NOTE: As of 12/8/17, TheCookingGene.com was updated to feature Michael W. Twitty’s book, The Cooking Gene: A Journey Through African American Culinary History in the Old South. Much of the content you will find in the site’s blog and associated pages is related to The Cooking Gene Project and The Southern Discomfort Tour, the important projects and journeys that inspired the book and have led to Michael’s appearances throughout the United States for book signings, lectures, and educational presentations. You will find that this content is dated back to 2012 and there may be references throughout the site to the Indie Go-Go campaign, which has since concluded. 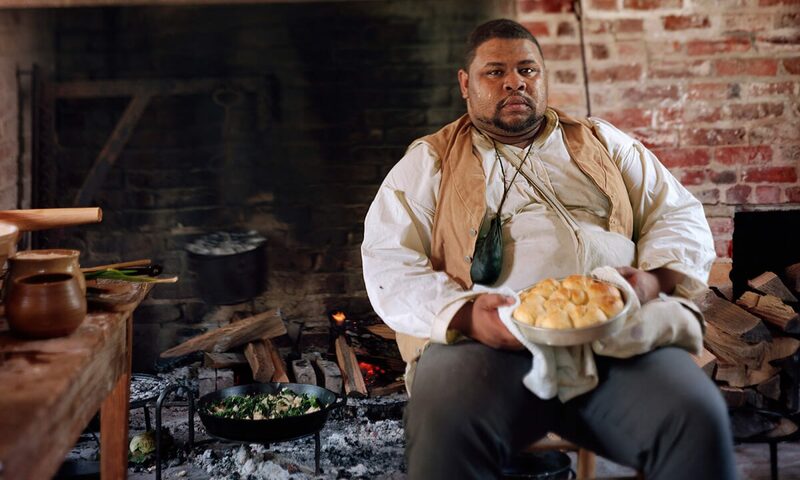 Michael is active on Twitter @koshersoul and his Afroculinaria blog. You can reach him by email at thecookinggene@gmail.com , through Twitter @koshersoul or his personal Facebook page where you can also learn about upcoming events. The Cooking Gene is the brainchild of Michael W. Twitty, a writer, culinary historian, and historical interpreter personally charged with preparing, preserving and promoting African American foodways and its parent traditions in Africa and her Diaspora. Michael is a Judaic studies teacher from the Washington D.C. Metropolitan area whose interests include food culture and history, Jewish cultural issues, and African American history and cultural politics. The Cooking Gene will highlight and address his journey to trace the food-steps of his ancestors in the Old South, using the story of African American foodways to follow his ancestors from Africa to America and from slavery to freedom. The Cooking Gene Project and The Southern Discomfort Tour will serve as vehicles to promote greater awareness of African American contributions to the development of Southern cuisine; promote community service and development, support the local economies of Southern communities and African American food producers, as well as encouraging dialogue that leads to racial reconciliation and healing in communities whose history and culture is a legacy of slavery and the slave trade. The Cooking Gene began as an idea–what if an African American could trace their ancestry back to slavery, and perhaps beyond, intertwining the ancestor’s journey with the story of their foodways–using just one aspect of the African and African American contribution from the colonial and antebellum period as a vehicle to demonstrate the importance of knowing about the individual lives of enslaved people. Although it may seem as though we have a handle on “The Peculiar Institution,” as a nation, as part of the Western world, as part of the Atlantic world, we don’t. There will never cease to be a need to tell our ancestors story and pass it down from generation to generation. As those elders whose grandparents were enslaved die off–we will never get them back. I am going into our old country–the Old South to record stories and collect living artifacts–seeds and recipes and other aspects of folk culture–because once they are gone, they will not return–they will be lost forever. This is an act of culinary preservation and cultural pride. In an era where our economy is down and the “food desert” is spreading, we need to make sure that we support African American farmers, fishermen and food producers as well as use our collective muscle to promote better eating and health in our communities. We are interested in food justice. We are interested in creating community gardens, increasing support for local food systems, and increasing greener living and sustainability culture in Southern communities of color. By connecting the history of the past with the stories of the present we want to make sure that we move forward together stronger, living our ancestors dream of freedom, prosperity and blessing. We understand that in this era, we have not transcended “race” or “race politics.” We understand that there are still issues to be solved and challenges to be overcome. We still need to understand our collective story. We still need healing. We still need to sit down at the table of brotherhood as Dr. King exhorted us a long time ago–as the sons of the formerly enslaved and the sons of the former slaveholders. This project is putting me in touch with the families who owned my family–to break bread–to cook together, to talk together over food–and hopefully bridge the gaps created by the racial injustices of the past and the cultural politics of now. To that end we are going to produce this blog, with photographs and video documentation, to bear witness to not only the story, but to show how communities are using food as a bridge across racial boundaries and to promote “coming to the table of brotherhood” as a means to bring healing into communities and between them. We are hoping that with the mountains of documentation we collect that we are able to use our footage and transcripts of conversations, workshops, demonstrations and dialogues to give texture and richness to further projects–books or documentaries. But the journey starts here. We will post daily leading up to our journey and we will post words, recipes, photos and videos as we make our journey through the Old South’s corridors–from Maryland to Louisiana and back–telling the story of my ancestors and all African Americans who were held captive by King Cotton. I want you to come with me as I go into the cotton field. I want you to come with me as I work in tobacco and rice. I want you to follow me into the kitchens–high and low–of historic plantations to discover the origins of soul food but also to discover American cuisine’s debt to enslaved Africans and African Americans. This is not just knowledge that can be found in a book. It is a culinary and cultural knowledge that must be lived and passed on–and we can only do that if we document and preserve it. Our product is our commitment to supporting local Southern economies and doing community service and workshops in places that desperately need a spotlight. We want to show the cultural capital of the contemporary South, while calling attention to the horrors and victories of the past. We don’t want to just hope for a better future–we want to make it possible by demonstrating how it can be done–and by doing so, transform the world around us. We want to model contextual genealogy–showing how our ancestors fit in the story of a culture and history–and anybody of any background can benefit from that! The spirit of The Southern Discomfort Tour is built around traveling through the Old South–with the spine of the trip following a route that traces the places, plantations, and sites of memory where my forefathers and foremothers were enslaved. As I travel to two programs in Mississippi and Louisiana, and hopefully more along the way, we will dig up genealogical data while cooking our way through the history of the Plantation South. We are cooking the entire way, and we are ready and willing to dialogue–with cousins–with family–with the people who owned my family–some of whom I am blood-related to–with farmers, chefs, restaurateurs, with passionate food people who are interested and captivated by this story. This is about all of us. Over 60 days on the road, we will travel and blog and educate, conduct workshops and do community service activities. We want to transform how our ancestors are remembered, but we want to better the lives of all people today. This is about food–but as you know–we are what we eat. And we are where we eat. And, we are what they ate. After we reach the end–the journey will not end–we will still make smaller trips and document those paths and processes as we tie loose ends together and enrich our narrative. You are any color, race, gender, orientation, political stripe, culture, ethnicity–however you identify. This is about how all of us got here–by way of our ancestors plates. We want everybody of every background to share their story. We are inviting you to partner with us to tell your own story as well–and we are going to show you how to do this in your own family and as your own journey. This has never been done before–so we’re waiting for you and the wisdom you have to share. On February 1, 2012 we will be launching our campaign to fund The Southern Discomfort Tour on Indiegogo.Com please see our FAQs to find out more. Pingback: Interpreting Slave Life » Are you checking for the Cooking Gene? Thank you for the cooking gene. I love the work that you are doing, and I know people and graduate students who would be interested and benefit from what you are doing. I am going to share your site.